1. Wash all the ingredients nicely to remove all dirt. Do not remove the peels. 2. In a chopper, add small pieces of all the ingredients and chop it. 3. Using a sieve, extract out the juice from the chopped vegetables. 4. 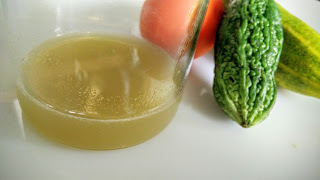 Drink this juice regularly in the morning and you will surely get the benefit of this juice. Note - Alternatively, one could also use a juicer to extract the juice.